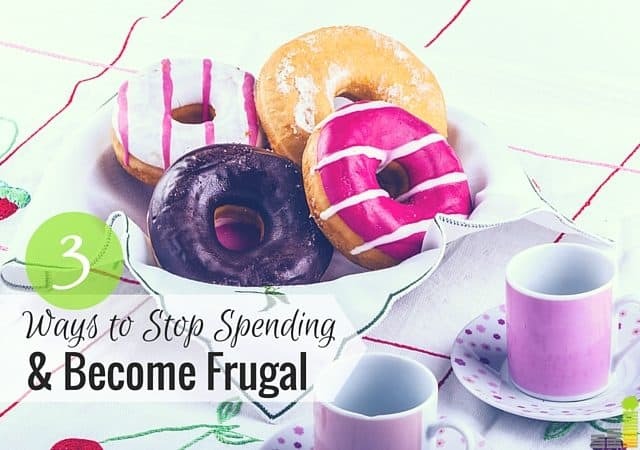 If you want to stop spending and want to embrace frugality, the process to switch on over to the frugal side of life isn’t as complicated as one might think. After all, spending habits, much like eating habits, really come down to the amount of self-control you have, which is something we all can work on incrementally over time. 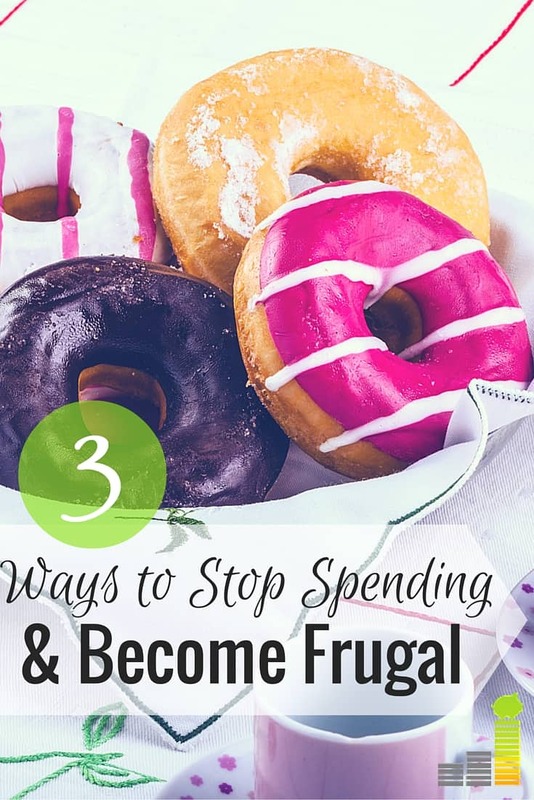 For the record, no one expects a recovering spender to switch cold turkey into never buying anything fun ever again, but there are ways to embrace frugality one step at a time. Following are some tips for recovering spenders who want to become frugal. If you’re on the path to financial wellness and you want to embrace frugal living, it’s very important to take an inventory of the people you spend time with. It might sound a bit harsh, but if you’re constantly surrounded by people who love to shop and aren’t frugal, it’s going to be hard for you to resist temptation. Just this morning, my mother-in-law brought me doughnuts from the most amazing doughnut shop in the world, and as I’m sure you can imagine, this is not something I could resist. If I wanted to lose weight, visiting Louisiana for a few weeks like I’m doing right now would probably not be the best idea. I went off on a bit of a tangent, but I just wanted to give an example. Essentially, again, it’s quite similar to dieting. When you’re around people who eat fast food and doughnuts all the time, it’s going to be harder to say no to the foods you aren’t supposed to eat. Similarly, if you’re around spenders, it will be hard not to spend. So, get a tribe. Join Facebook groups that share tips on frugality. Start a personal finance blog. Meet up with other college students or moms or people in your church who are trying to improve their finances. It’s hard to embrace frugality on your own but with a tribe, you gain the support you need to get there. Many people know it if they are a spender, but most of the time, they don’t know exactly where their money goes. The next step to being a recovering spender is to be informed. Whether you use an online tool like Personal Capital or simply write it down on a piece of paper, tracking your spending is essential to getting an accurate assessment of your financial situation and the knowledge you need to make positive changes. Once you have a better idea of where your money is going each month, you can know where you need to cut back. For most people, they overspend on food and shopping. Sometimes, avoiding going to the mall or skipping Starbucks is just the habit change they need to really stop spending excessively once and for all. Once you get a tribe and you track your spending, something happens to a recovering spender. Essentially, you start to feel empowered and even excited. Most people don’t realize what a rush it is to have control over your money. We all like to feel accomplished and successful. Tracking your spending and cutting back on it is a great way to build confidence in your financial abilities and really change your life. Even if you start small, it’s the little steps like paying off small credit card balances or passing up buying a 3:00 snack that can leave you feeling successful and empowered in your financial journey. People who were former spenders start to get excited about the amount of money in their savings account and the fact that their credit card debt is decreasing. Essentially, once you start down this path and you have an amazing tribe to keep you accountable, there’s no turning back. Frugality is addicting, and the feeling of accomplishment you get from being financially fit is like nothing else you’ve experienced. Ultimately, anyone who is a recovering spender can absolutely become someone who loves being frugal because frugality is much more than cutting coupons or shopping around for the best deal. It’s a way of life where you’re simply satisfied with less. You won’t require name brands, large, expensive homes or pricey meals out to be happy. Instead, over time, as you embrace frugality more and more, you get simply more content with your life. So, if you’re considering becoming frugal after developing some spend-y habits, I say go for it. After all, you really have nothing to lose. Are you a recovering spender? Did you embrace frugality later in life? What does ‘frugal’ mean to you? What items do you allow yourself to splurge on? I have found that tracking everything has helped us become more frugal. It is hard to know how spending affects you if you don’t know how much you are spending! So true – and those little purchases really do sneak up on you! I can totally relate to this! If it weren’t for my college friends, I doubt I would have ever gotten on the pf train. It’s important to be around individuals who share the same values as you do. They sound like great friends!! Great post. I don’t usually give in to peer pressure, but it is easy to slip if no one is keeping you accountable. I set very high savings and debt repayment goals, so any little purchase forces me to chose between that item or getting closer to meeting my goals. Ooh that sounds good — I personally love goal setting and reaching them of course! Great post and tips. The one thing I find is that on our journey of debt repayment we often end up on a roller coaster. Two steps forward and one back is the dance we live in. Though I strongly believe this will be our year as things are looking up all the way around. And YES tracking everything helps a lot. I can’t wait though to build a little cushion for a change. 🙂 Keep up the good work! Woo hoo – good luck on your cushion! I have to say that tracking everything is key to help you to stop spending and start being frugal. By tracking all your expenses and income, you know where you overspend or under spend and adjust your spending accordingly.In a nutshell,it is by tracking your spending that you learn how to handle your spending. Yes I say that all the time. Most people just don’t realize how much they spend! OOoh dang, that doughnut picture is tempting. But so is spending a lot of money! I think it’s important to have a fellow frugal tribe to hang with. Social pressure and judgment can be a total frugality killer. Know where you want to go and cut any negativity out of your life! I love me some doughnuts! That’s a great reason to want to stay home! I’m tracking all my expenses since October last year (19 categories like education, hygiene, food, alcohol, sweets, furniture,…) and my libre office sheet has nearly 900 rows. It just became absolutely data grave. I don’t have the slightest idea what to do with all this data. It’s easy to be frugal when I know how much budget I have for certain expenses and it’s easy track my expenses. Yes the budget is key for me too actually! I think it’s really important that you have the motivation behind being frugal or you simply won’t stick with it. That motivation can come from anywhere, whether it’s to pay off debt or to be able to afford a nice vacation a couple years from now. My daughter is helping me and she is a huge help. What do I do, though, when my monthly expenses are more than my income? I’m a senior citizen, and can just work at so many jobs. Financial retirement is hard! Great article, Cat!!! The Tribe idea is awesome. Surround yourself with Like Minded People and it really helps build stamina and momentum. I’ve really curbed my spending over the years. I’m really not missing things that I haven’t bought. Now I need to sell some that are just lying around.